Lys Anzia is an American historical playwright. She has had her poetry published in Other Voices International, Muse Apprentice Guild, Poets Against War (with Sam Hamill), and in other literary magazines. You can find her at lysanzia.com. Marcia Arrieta – has been published widely in the small press throughout the years. publication credits include tinfish, so to speak, xtant, heaven bone, 88, oracle, abraxas, cold mountain review, osiris, big scream, lost & found times, yefief and others. Her chapbook experimental: was published by potes + poets press (CT). 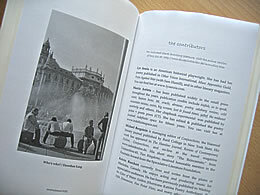 She has edited & published the poetry journal indefinitespace.net for fifteen years. Michael Bergstein is managing editor of Conjunctions, the biannual literary journal published by Bard College in New York State. His work has appeared in The Hamline Journal, Review of Contemporary Fiction, Conjunctions, and online at the travel magazine subsidezine. His short story “The Reincarnate,” from Conjunctions:41, Two Kingdoms, received honorable mention in the Fountain Award from the Speculative Literature Foundation. Kelvin Bueckert currently lives and writes from the plains of Manitoba, Canada. He enjoys acting and producing music for appreciative audiences. He has been previously published in: Washing the Color of Water Golden, The Fifth Dimension, Pen Point View, and many others. Kelvin has also received an Honorable mention in the Unscrambled Eggs poetry contest. Learn more about Kelvin at his website: kelvinbueckert.com. Sita Carboni is executive director of Vancouver's Pandora's Collective, a non-profit society dedicated to promoting the literary arts. She has been featured at the World Poetry Readings Series, Word on the Street and the North Shore Writers Festival. Her poetry can be found in Quills Canadian Poetry Magazine, Luluzine and Good Gosh Almighty. Jeff Crouch is an amateur artist in Grand Prairie, Texas. He plays at art as though it were a game of hide and go seek. His graphic work has appeared in ardent, moria , eratio, JMWW, Quill and Ink, Spoiled Ink, Triplopia, Subtle Tea, Prose Toad, Lily, Ink Pot, DogEar, Expose'd, Dicey Brown, 63 Channels, The Lampshade, Unlikely Stories, zafusy and others. Peter Dabbene is a Hamilton, New Jersey-based writer. His poetry has been published in many journals, both print and online. He has also published two story collections, Prime Movements and Glossolalia, as well as a novel, Mister Dreyfus' Demons. Some of his stories can be found online at parentheticalnote and eyeshot. Kari Edwards is author of obedience, Factory School (2005); iduna, O Books (2003), and a day in the life of p.
edwards' work can also be found in Scribner's The Best American Poetry (2004), and Bay Poetics, Faux Press, (2006). Helen Ellis, a member of the Queensland Writers Centre and the Romance Writers of Australia Inc, has been an editor for trade and charity magazines, written musical adaptations, revue sketches and many published articles. Her first novel for children, Max and the Gang of Five, is available from Zeus Publications. Zdravka Evtimova lives in Bulgaria. In her native country she has won the Gencho Stoev national Short Story Award and The best contemporary novel award for her novel Thursday (2003). Her short stories have appeared in USA, UK, Canada, Australia, Germany, Japan, France, Russia, India, Czech Republic, Poland, Hungary, Argentina, Turkey, Nepal, Macedonia and Serbia. J. Fisher writes, lives and works in the core of Victoria. His first poetry collection, Death Day Erection was released through Frontenac House in '04. His new collection" punching against useless junk " is slated for late 06. Gerald George was born in Fort Worth, Texas, where he now lives again. He was educated in Houston and Berkeley, began writing poetry in college and started to take it seriously after encountering san francisco poets in the late 60's. He began performing publically in earnest in the mid-nineties, and exploring the internet since 2001. His poetry collection Findings – selected and new poems from over forty years is available at Lulu.com. Tasnim Jivaji is an emerging writer and poet. Born and raised in Kenya, she now lives in Canada with her wonderful husband and three children. Her previous many years working in the airline industry took her to glorious and exciting places. Currently studying for the Certificate in Creative Writing at the University of Toronto to freshen up and fine tune her writing skills. Dorothee Lang is a German writer and net artist. She is author of Masala Moments, a travel novel about India, and editor of the BluePrintReview, an online journal of unintended prose and poetry. Her work has recently appeared in Pindeldyboz, Word Riot and eclectica, and others. To see some of her latest pieces, visit her virtual gallery at blueprint21.de. Mark Lavorato is a Canadian writer working hard on his second novel, having published shorter fiction in Stranger Box, Miss Saphira's, and Zeugma; and poetry in Inscribed, Leaf Press, Kid Rocket, Poetry Canada Magazine, Miss Saphira's, Armada Quarterly, Cerebration, and Ascent Magazine, where he won first place in their Premier Print Edition Contest. Wes Lee – originally from UK, Wes Lee currently lives on New Zealand's Kapiti Coast. She directed her black comedy, ‘Woman with a Weapon' at the Maidment theatre in Auckland and recently was an award winner in AUSWRITE (06). Her writing has appeared in various online and print publications, including: VerbSap, Snorkel, Turbine, Blowback Magazine, Mannequin Envy, BuzzWords, Libbon, HeavyGlow, Opium Magazine and she has work forthcoming in a number of anthologies. Luciana Lopez is currently a reporter at the Oregonian newspaper. Her short fiction has appeared on Flashquake.org and the McSweeney's website. Jewel Martin is a poet, and a painter. She is a 33 year old, married, native born Floridian. Her prose and some of her photography have been published in the online Journal Sage of Consciousness E-Zine and the print journal, Imprints. Her writing has always been vague and shrouded in enigma. Smitha Murthy - lives in Bangalore, India and writes a bit and wonders a lot more. Dreamer and drifter. A restless wanderer in the wilderness of this world. Trying to learn. Trying to swim, to run, to walk, to roam through life - but really trying to just be. Diane Payne lives with her teenaged daughter, Ania, and several dogs and cats in a small town deep in the Delta region where she teaches English at University of Arkansas-Monticello. She is the author of the novel Burning Tulips. More about her writing can be found here. Kyle Richtig sometimes writes on the computer. Sometimes he gets out a pen. His days of scribbling in pencil on the wall are over. He lives in Whitby, Ontario, and is co-founder of the environmental organization Green Tomorrow and the magazine Inscribed. Kyle has been published in both electronic and print formats internationally. He is currently working on a novel that was never meant to be. His website is: ww.kylerichtig.com. Sharon Rothenfluch Cooper is an active member of the Friends of The Oregon Symphony, participant in the Well Arts Institute devoted to Mental Health, Words Of A Woman Net Society, poet-in-residence at The Argonauts' boat and soldiersheart.org and very much a today's woman. She's had several chapbooks published online in 2004 by Tamafyhr Mountain Poetry, Mood Magic and A Slice Of Life and is winner of the 2005 International Chapbook Competition. Ania Szado lives in Toronto, Canada. Her novel, Beginning of Was (Penguin Canada 2004), was regionally shortlisted for the Commonwealth Writers' Prize: Best First Book. Her short stories have appeared in several literary journals and magazines, and in the anthology All Sleek and Skimming (Orca 2006). Visit her website at www.aniaszado.com. Davide Trame is an Italian teacher of English, born and living in Venice / Italy , writing poems exclusively in English since 1993, they have been published in around two hundred literary magazines since 1999, in U.K, U.S. and elsewhere. Patrizia Villani is a poet, translator, and teacher at Milan State University. She writes in English and Italian. Her poems have appeared in magazines (Agenda, GB, 2002; La Clessidra 1/2005; Poesia n. 195, 2005) and websites (Conjunctions, USA, 2003; La Mosca di Milano, 2004) in Italy and abroad. She is currently working on a joint project (collection Americana) with a painter. Steve Wing once rode the fast train in Spain, and the countryside went by so fast he couldn't focus on anything. That is the way his life feels much of the time. Occasionaly he gets a moment of clarity amidst the blur, sometimes in the form of an image or lines. A selection of those images can be found in his photo gallery sand shadow. Diana J. Wynne lives in San Francisco where she writes stories, true and otherwise. She pays for sushi and cappuccinos by producing interactive content and designing software, and collects her real-world user experiences in a daily interface. Her essays have appeared in the New York Times, The Christian Science Monitor, Exquisite Corpse, Raw Story, and others. She is currently at work on a screenplay, a documentary, and a business plan for a startup. Make her an offer.